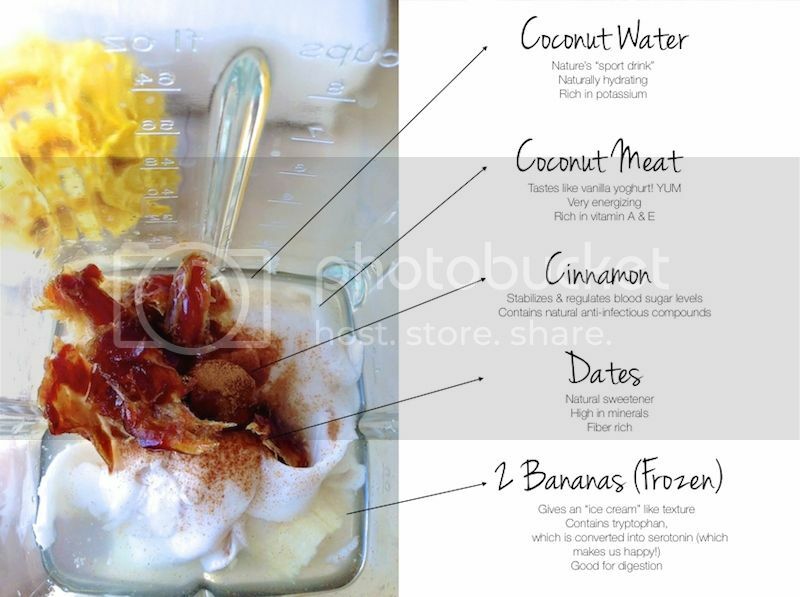 Annie Jaffrey: Coconut Banana Smoothie "Ice Cream"
Coconut Banana Smoothie "Ice Cream"
Hi everyone, hope you are well! Today is day 10 being fully raw *woop*! 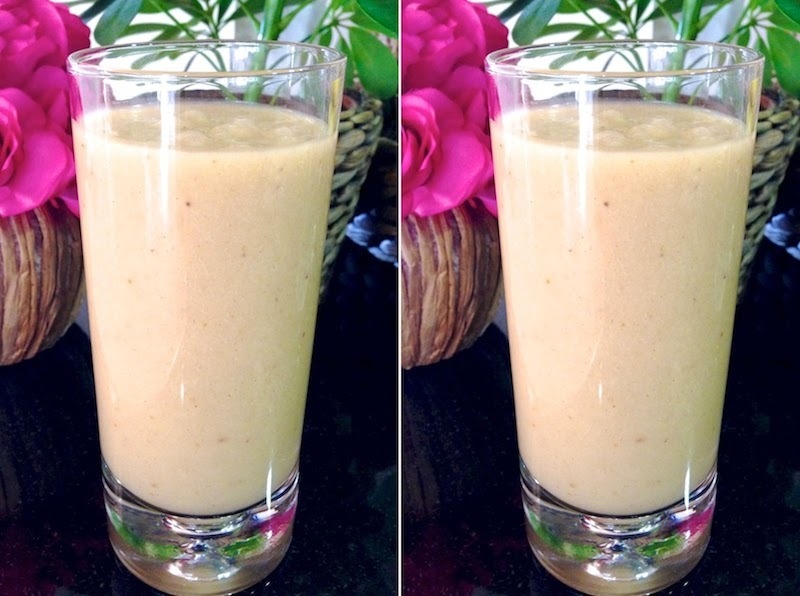 This morning I made this absolutely delicious coconut banana smoothie which tasted like heaven! Something I love about Dubai are the wide variety of fruits and vegetables available (especially at the farmer's markets). I picked up some young coconuts the other day (costs equivalent to $2.50) and decided to use both the water and flesh in a smoothie. I had placed some bananas in the freezer last night so decided to use those too. And then I added some cinnamon and dates to give a really nice flavor! It turned out delicious ♥ You can also use coconut meat to make raw yoghurts and puddings - yum! Place all ingredients into a high-speed blender, and voila! That look and sound so delicious that I have to try it. On my next visit to the grocery store I will definitely be buying the ingredients. Thanks Annie for this amazing recipe! It looks delicious and super healthy! I was looking into making dome dragon fruit smoothies with coconut water and cranberries. You are an inspiration and I hope raw die will be suitable for you. This looks like such a treat! Thank you for sharing! annie, could you do a video on how you manage being raw while living together with your partner? is kareem supportive of your raw lifestyle? how do you guys eat out on dates and stuff? i'd really like to know because this is one of the biggest challenges for me going raw. thanks! p.s. you look prettier and prettier each passing day! loving the raw glow! ugh,this looks absolutely delicious ! thank you for sharing your recipes :) oh and i can't wait to see your beach workout video !also do you take yoga classez or do you just do it at home? oh wow this sounds super delicious and tropical! i'd love to try that on the weekends too! Awesome Annie! I am really moved by your spirit and efforts to heal your body. You are such an inspiration to me (smart, beautiful and courageous) and I am looking forward to read your blog and learn along with you :) Thank you! Hey Annie, I think you will like this other raw pasta sauce. I just made it for myself and it tasted so fresh and good! You can put it on your salat or use it as a dip. you can let it sit for 2-8hours after mixing it all together in a bowl or blend it lightly in a mixer. I choosed to blend it and have it right away and it already was so good! Much love and best wishes for your health sweety. I watched your video where you talked about how this lifestyle cleaned out your skin.I have found out about this a year ago and ever since then planing to do it for a few days and see how it goes but I'm scared of losing my muscles. I know raw food belivers say you get enough protein trough fruits, vegetables and nuts (and also enzimes) but i would like to hear how did it effect on your body, did you see any gain/lost of muscles and general weight? One more thing, are you afraid thet you will get just to eating a lot of food and then gain weight once you stop doing it (if you are planing to stop offcourse)?